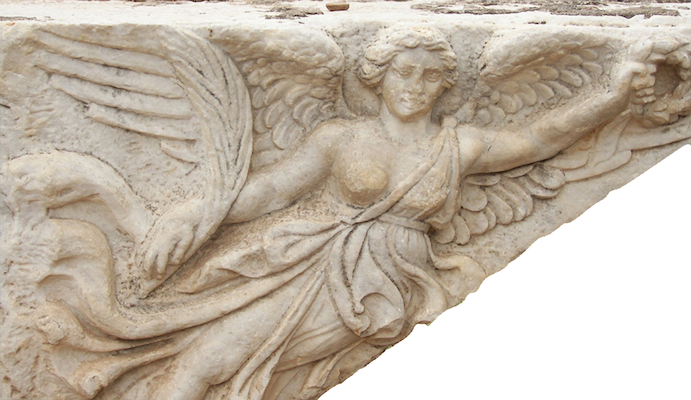 Goddess Nike [Victoria] monument at Ephesus. Monument depicting the goddess Nike, found at Ephesus, one of the seven cities of Revelation. ©copyright holder of this work is Richard E. Oster. Page 110, figure 59. Praying youth expressing reverential posture, located in the Pergamum Museum, Berlin, Germany. © copyright holder of this work is Richard E. Oster. Page 110, figure 60. Expectations of a typical worshipper of Asclepius is that the god will answer prayers. 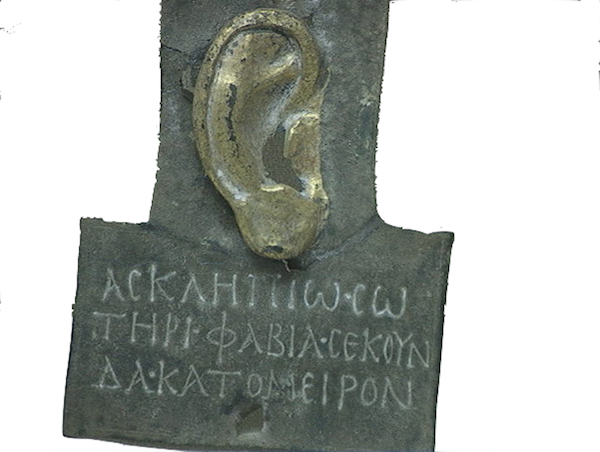 The iconography of this artifact agrees with the sentiment of the Greek since it is dedicated to Savior Asclepius. 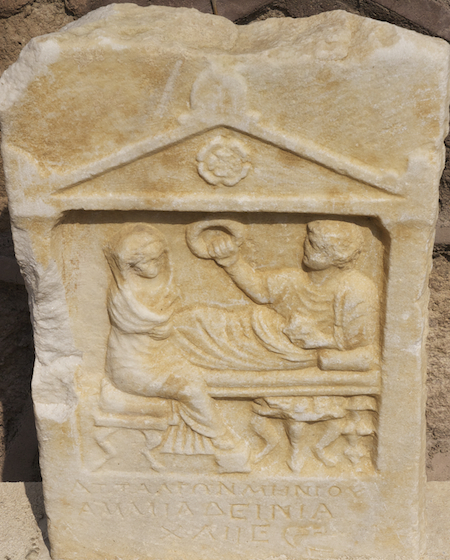 Rather than asking Savior Asclepius for the healing an ear, the devotee is reminding Asclepius that he is a god who hears. © copyright holder of this work is Richard E. Oster. Page 110, figure 61. 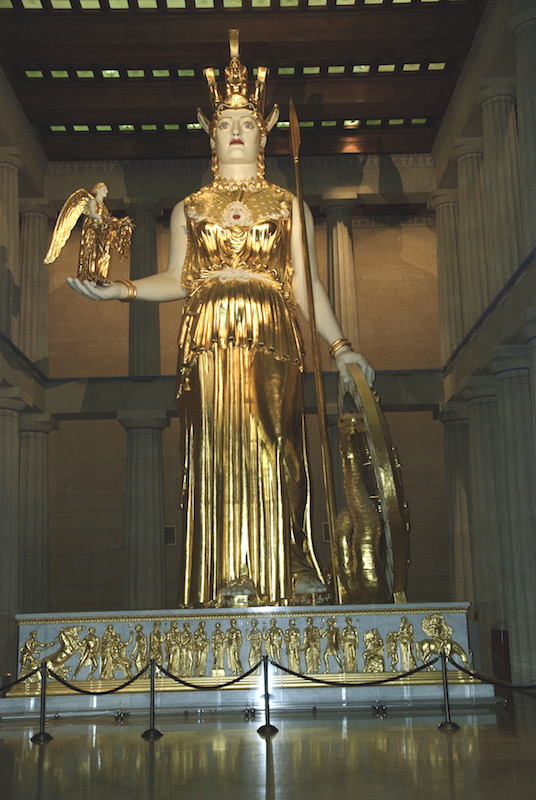 There is a replica in Nashville, Tennessee of the original Parthenon Temple located on the Acropolis in Athens. © copyright holder of this work is Richard E. Oster. Page 111, figure 63. 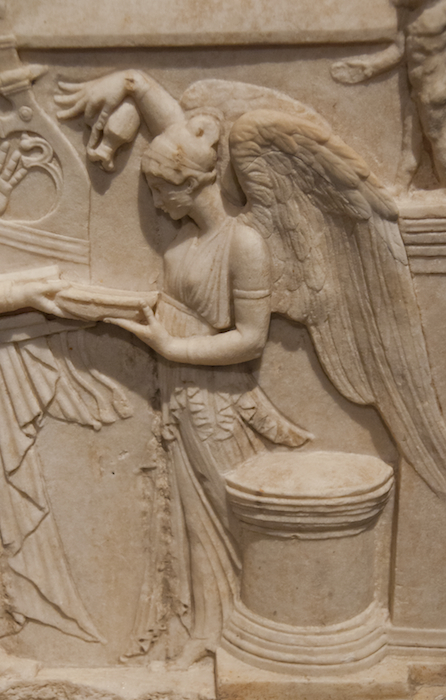 Nike offering libation, a liquid offering; located in Pergamum Museum, Berlin, Germany. © copyright holder of this work is Richard E. Oster. Page 112, figure 66. Nike ornament, located in the Altes Museum, Berlin, Germany. © copyright holder of this work is Richard E. Oster. Page 112, figure 67. 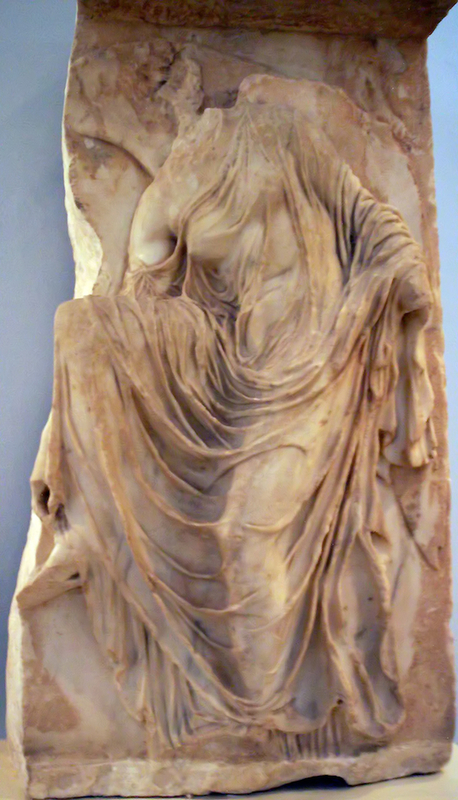 Nike (“Nike loosening her Sandal” ) is involved in bringing sacrifices to the goddess Athena Nike to celebrate the military victory of Athens over Sparta in the Peloponnesian War in the late 5th century BC. 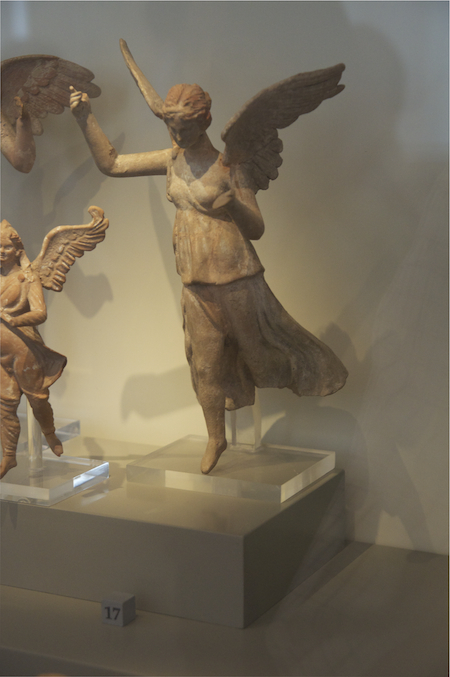 Statue from the Temple of Athena Nike (now in “New” Acropolis Museum). © copyright holder of this work is Karen Green and is used with her kind permission. Page 113, figure 70. 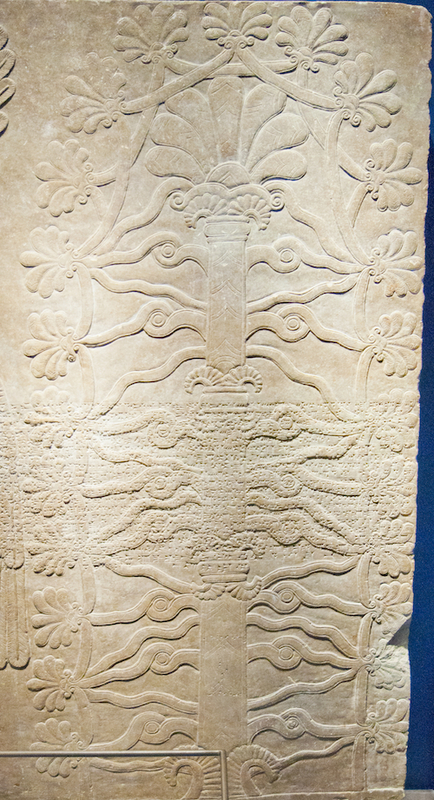 This image represent an Assyrian sacred tree, identified by some scholars with the idea of life. The idea of the sacred tree has a very long history in the art of the Ancient Near East and shares some similarities with the Jewish tree of life, from which the prophet John derives his ideas of the tree of life. These panels are located in the Brooklyn Museum, New York, New York. © copyright holder of this work is Richard E. Oster. Page 114, figure 71. Sacred Tree This Assyrian monument depicts two supernatural beings who take care of the sacred trees. 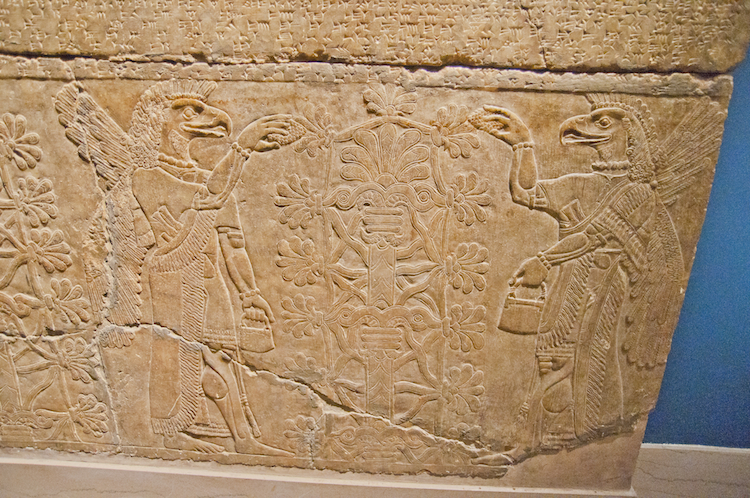 Archaeologists suggest that in this scene the supernatural beings are pollinating the trees. These panels are located in the Brooklyn Museum, New York, New York. © copyright holder of this work is Richard E. Oster. 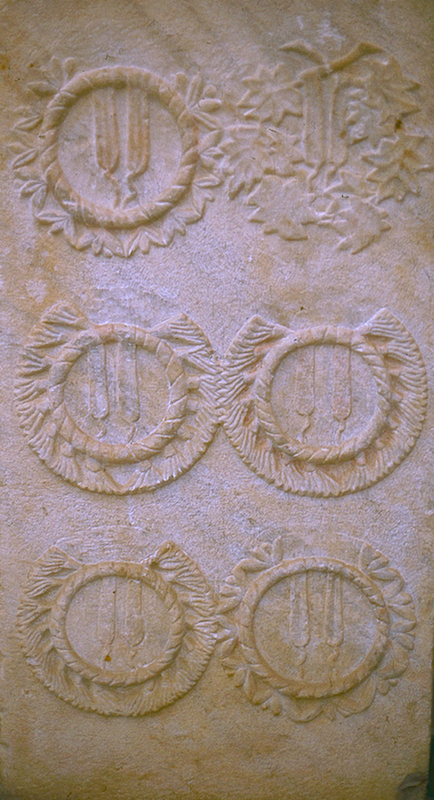 Monument from Ephesus depicting the several crowns awarded to an individual. © copyright holder of this work is Richard E. Oster.Page 127, figure 77. 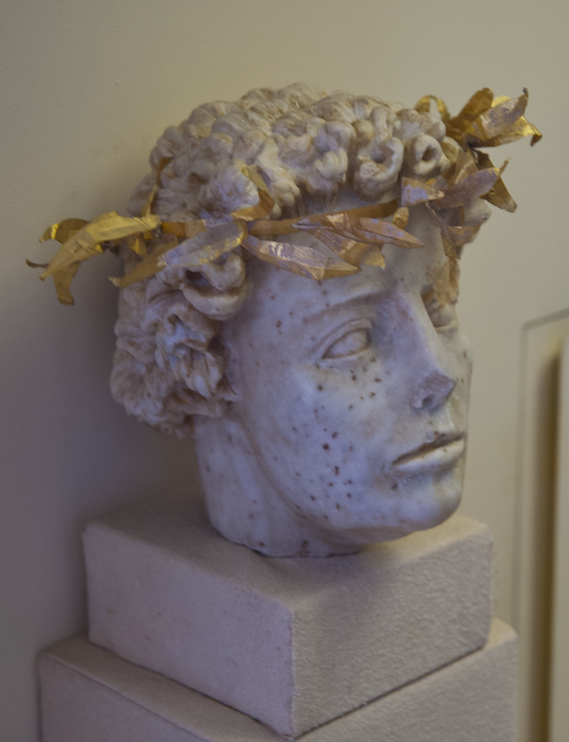 Bust of individual wearing the gold leaf crown. This item is located in the Museum of Anatolian Civilizations in Ankara, Turkey. © copyright holder of this work is Richard E. Oster. Page 127, figure 78. Typical crown, this one located in the Metropolitan Museum, NYC. © copyright holder of this work is Richard E. Oster. Page 127, figure 79. 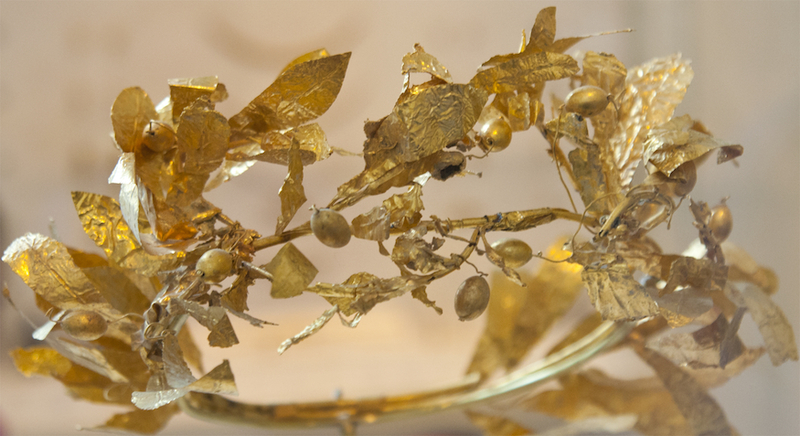 Golden diadem, located in the archaeological museum in Hierapolis, a city mentioned in the New Testament (Col. 4:13). © copyright holder of this work is Richard E. Oster. 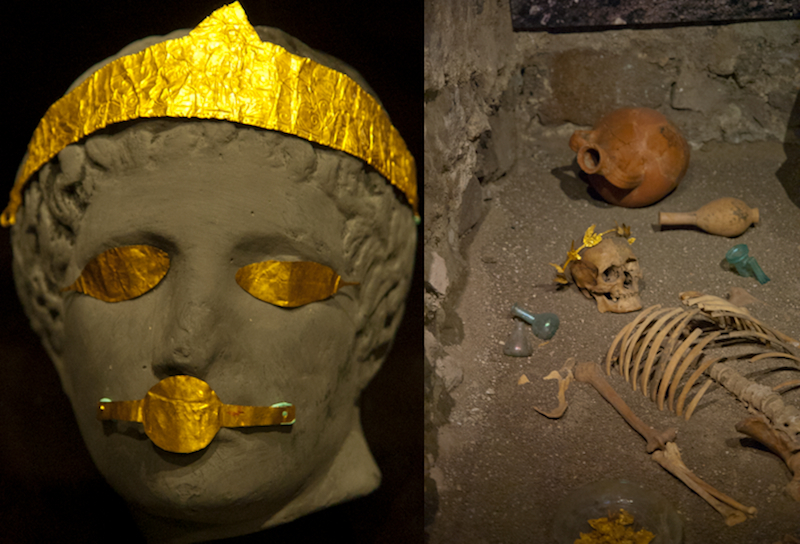 Pictures of burial finds with golden victory wreaths. Image on right is located in the Museum of Anatolian Civilizations in Ankara, Turkey. Picture on left is model of a woman wearing a golden burial crown, located in the Archaeological Museum, Izmir, Turkey. © copyright holder of this work is Richard E. Oster. Page 128, figure 81. Sepulchral monument showing the deceased holding a crown of victory. © copyright holder of this work is Richard E. Oster. Page 129, figure 82. 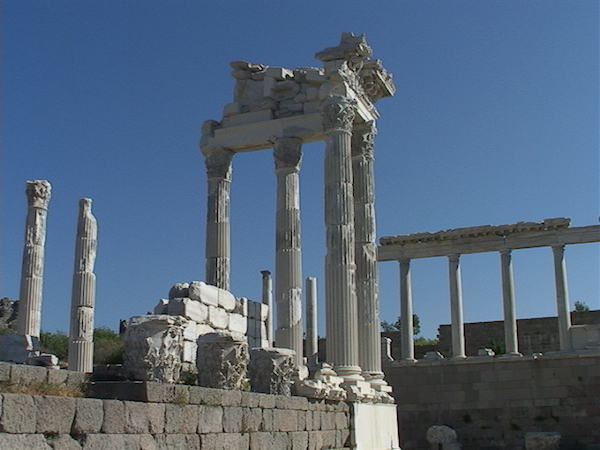 One of the great monuments to the Emperor Trajan in Roman Asia was built on the acropolis of Pergamum during the early decades of the second century AD. It was constructed on the highest point of the acropolis during Trajan’s reign but was expanded by his successor Hadrian. © copyright holder of this work is Richard E. Oster. Page 139, figure 89. 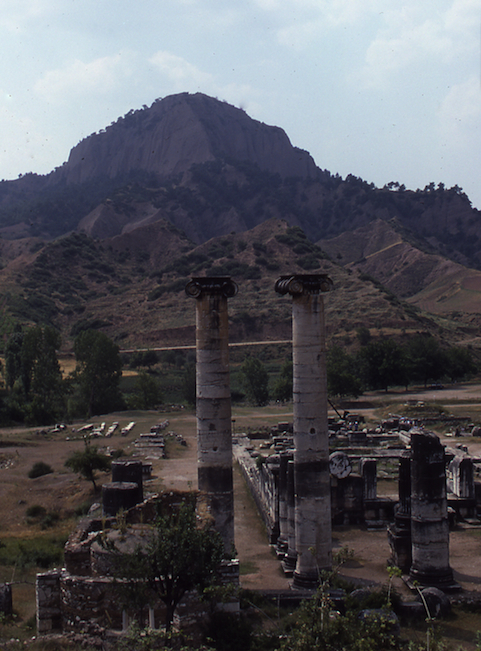 Temple of Artemis in Sardis, first begun in the early Hellenistic period and reaching completion in the second century AD. Its main columns were almost fifty feet tall. © copyright holder of this work is Richard E. Oster. Page 161, figure 96. Caryatids showing human forms as pillars in a temple. 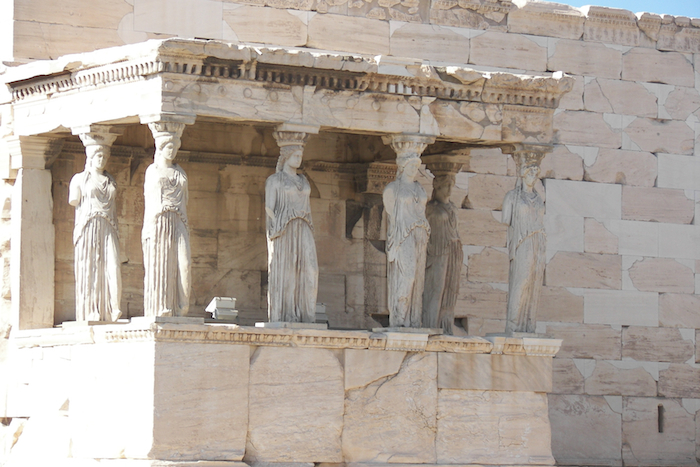 These are in the Erechtheion, on the Acropolis in Athens. 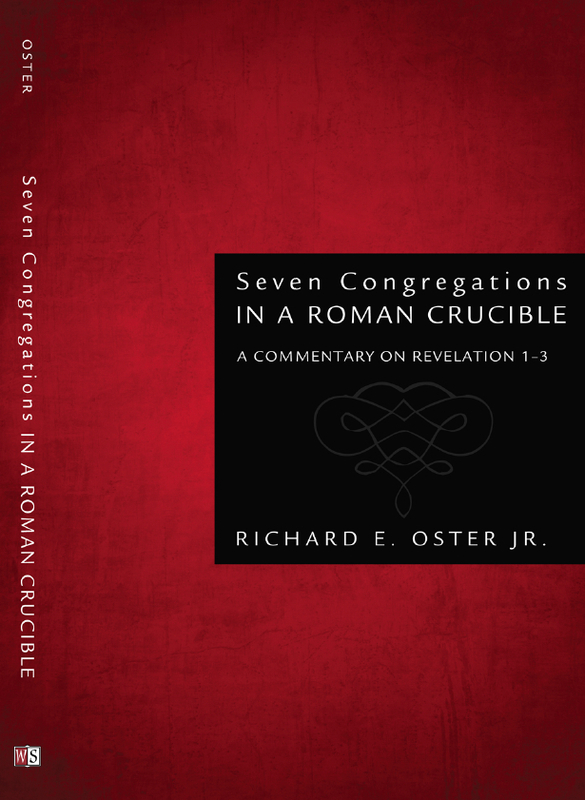 © copyright holder of this work is Richard E. Oster. Page 181, figure 98.